If your business is about ready to open its doors to the public, learning how to promote the big event can help generate traffic that first day. A successful opening day can get things off to a good start that carries into those first weeks and months that can make or break a new business. Successfully promoting the opening day for a business requires planning and creativity. Do more on your first day than just open your doors as a way of getting people to come in right away. Consider offering special activities or giveaways on opening day to transform the event into a celebration. Host a ribbon-cutting ceremony complete with local government officials (mayor, council members, etc.) and local press. Give a t-shirt, hat or other logo promotional item to the first X number of visitors. Provide free refreshments throughout the day. Offer entertainment at various times throughout the day. Offer an opening day special of deeply discounted or free services. Partner with a local nonprofit organization, for example offering a coupon or freebie for those who bring in a few cans of food for the local food bank. As a new business owner, getting involved with the local business community is something that you definitely need to do. Start participating in business networking groups a few months prior to opening day so you can start getting your company's name out and begin making contacts. Consider joining groups like your local Chamber of Commerce, a Business Networking International (BNI) referral marketing group, and other relevant professional or civic organizations. Attend meetings and events regularly. Set up a Facebook business page and a Twitter profile for your business four to six weeks in advance of opening day. Consider other options that may be appropriate for the particular type of company you are opening as well. For example, if your business is in the music or entertainment industry, MySpace can be helpful, while Pinterest is a great option for food, craft, home decor and other topics that lend themselves to visual presentation. Create a social media content plan that includes fun, teaser-style information designed to begin generating interest in your new venture. Post regularly, approximately three times per week to get started. During the week immediately before opening day, focus on sharing information about special offers and activities that will be going on the day you open your doors. To begin building a following, start by asking your friends to follow these social profiles, and encourage them to share your pages with their contacts. Once you know what day you will be opening and you have a good idea of the activities that will be going on throughout the day, create a new business press release. Send the press release to local media outlets, including newspapers, television stations, radio stations and magazines. If you have joined any professional organizations, submit your press release to be considered for publication in the groups' newsletters. Identify relevant blogs, such as local shopping blogs if you are opening a store or food or travel blogs if you are opening a restaurant. Follow up on the news releases a few days after you send them out, offering to provide additional information and/or participate in an interview. Use a few of the many free online event promotion websites to help get the word out about your new business. Create profiles on event calendar sites like American Towns and Event Brite, then create an event for your opening day. Use the text from your press release to form the basis of the event description. Be sure to set up your opening day as a free event that does not require an RSVP. Consider taking out paid ads in local media outlets to generate interest in the opening of your new enterprise. Local newspaper, radio, television and website advertisements can be an effective way to reach consumers in the area where your business is located. You may find it more cost-effective and manageable to work with a professional media buyer who works independently or with an advertising agency than trying to do this on your own. A professional can help you select the best advertising mix and establish an appropriate budget. Professional buyers can also generally negotiate the lowest possible rates with sales representatives. Offer discount coupons with special offers available only on grand opening day or for a very limited time. Coupon offers can be provided via online sources like Groupon and Four Square. Include your coupon in any newspaper advertisements that you purchase. Ask other businesses in the area if they would be willing to offer your coupons at their front desk or counter, of course offering to reciprocate. Ask friends, family members and others interested in helping you get your business off to a good start to pass out coupons to their contacts. 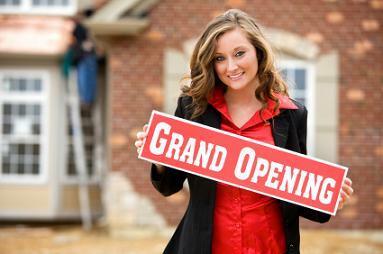 Place signage on your building, including your general business sign and banners announcing your grand opening. Get approval from your landlord before hanging signs. Verify that your signage is in compliance with any applicable permitting or zoning requirements. Your leasing agent should be able to help you identify any legalities that you need to be aware of regarding signage. Taking the time to create an effective promotional plan for your big day can go a long way toward getting your business off to a successful start. Use these ideas as a starting point and add your own touches to make the day a perfect grand opening celebration that kicks off the beginning of many successful days to come!